Walking by the Opolis in Downtown Norman one night, I heard an unfamiliar band. Even though I couldn’t listen long, I did peek into the “micro venue” to find out who was playing. Genuinely, I was surprised to find out it was Limber Limbs. I know Derek Moore because of his work with DEERPEOPLE, but by that point I still hadn’t given Limber Limbs a good listen. Right to left: Derek Moore, Robert Riggs, and Ben Bowlware. Photo by Doug Schwarz. 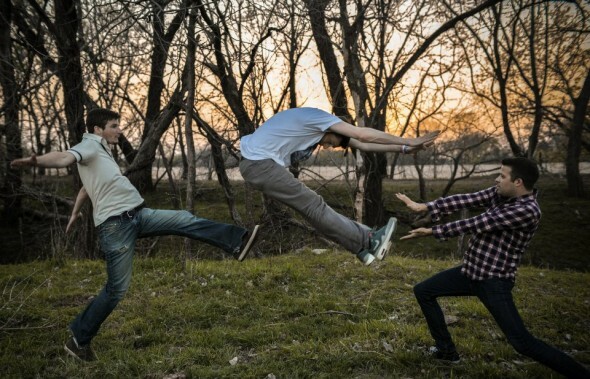 Limber Limbs is a reinvented band in some regards. Although they are still comprised of the original trio: Ben Bowlware, Robert Riggs, and Derek Moore, their previous name “People, People” was too hard to find on the Internet. They were essentially invisible to Google because a comma between the words “people” and “people” makes the search relevant only to the word “people.” Since they weren’t aiming to be intentionally obscure, the old name had to go. Other signs of evolution? This is a band originally formed in Stillwater. And while Bowlware and Riggs are primarily based out of Oklahoma City now, Moore still resides in Stillwater. But that won’t be for much longer. Moore says he has plans to join the rest of the band in OKC by this summer. Being closer as band means the OKC metro will be hearing Limber Limbs perform more often, a prospect I find encouraging, because they do sound good live. I liked their eponymous EP as a whole. Knowing that they’d snagged my attention once before, even if it was by chance, I shouldn’t have been surprised that I’d come to like the music so much. As it turns out Cameron Beckham Neal and Zack Zeller are listed as contributors on the EP. Both musicians are in another OKC-based band called Horse Thief, which I like as well. Neal played cello and sang backing vocals on Golden Rust, while Zeller also sang backing vocals on the same song. Other contributors include: Jason Daugherty on violin and John Hildebrand on cello. I’ve listened to the EP probably six or seven times over the course of three weeks, starting when I assembled my Norman Music Festival wishlist and again on the way back from Austin Psych Fest as I played it for my co-Editor. Limber Limbs has a good thing going on. If I had more time, I could see doodling while listening to it. This Shakespearean reference is well-placed when you take into account the variety of themes presented throughout the EP. There are plenty of references to the feeling of near claustrophobic pressure in coming of age as one takes up the mantle of adulthood. This can be heard in a song like “I’m Coming Back.” On the sonic end these sentiments are echoed when the band shifts from more sparse instrumental arrangements into a wall of sound that envelops you before slowly releasing the tension once more. These motifs not only appear in songs about troubled love, but more broadly throughout the EP. There are weighty choices to be made and the consequence of each carries its own burden. The reference to Hamlet’s mental fatigue in taking charge of his life and righting past wrongs seems rather fitting for a band fond of alliteration. 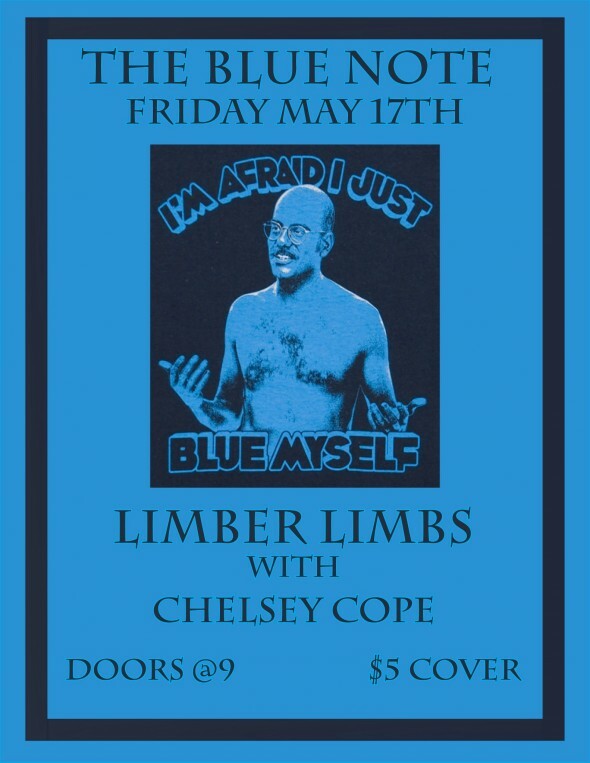 Speaking of seeing things, you can watch Limber Limbs and Chelsey Cope play The Blue Note this Friday. Doors open at 9 p.m. and there is a $5 cover. Check out their body of work via Bandcamp or follow them on Facebook. If you have to miss them, then take heart: we’ll likely have an interview with the trio up next week. Tagged age, Bandcamp, Ben Bowlware, Coming Back, DEERPEOPLE, Derek Moore, EP, evolution, Facebook, Horse Thief, interview, Limber Limbs, Moore, Norman Music Festival, OKC, Oklahoma City, Robert Riggs, video, Zach Zeller. Bookmark the permalink.